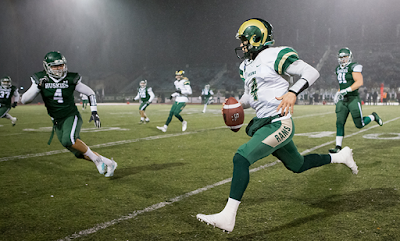 SASKATOON – The University of Regina Rams trailed by 27 points at one point in the third quarter and tried to mount a comeback, but Saskatchewan prevailed with a 33-20 victory in a Canada West game on Friday night at Griffiths Stadium. After going down 30-3 just past the midway mark of the third, the Rams scored 17 unanswered points on three consecutive possessions to cut the Saskatchewan lead to 30-20 early in the fourth. 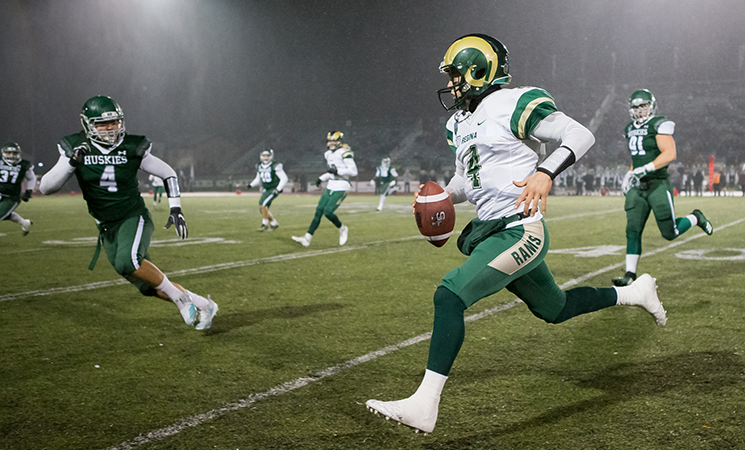 But with the Rams threatening to score for a fourth consecutive possession, Saskatchewan’s Bowan Lewis came up with the turning point of the game. He pulled down an interception in the end zone, and the Huskies then came up with a clock-chewing drive that resulted in a field goal with only two minutes left on the clock. Kyle Borsa had a nice 25-yard return on the ensuing kickoff, but Saskatchewan sealed the win after its defence came up with a stop on a third-and-short situation at Regina’s 49-yard line. Borsa was a bright spot for the Rams, rushing 16 times for 96 yards including a pair of touchdowns. Noah Picton completed 21 of his 34 passes for 271 yards, with Kyle Moortgat leading all receivers with nine catches for 136 yards. Zach Moore had a big game on defence for the Rams, collecting his second interception of the season and forcing a fumble that was scooped up by Robbie Lowes. The Rams are now tied for third in the Canada West standings with Manitoba. Both of those 2-2 teams will meet next Saturday afternoon at Investors Group Field in Winnipeg.